Drench lips in up to 16 hours of super-saturated matte colour! The long-lasting formula achieves an intense matte finish in 5 fierce shades. Get ready for an unapologetically bold pout! This limited edition liquid matte lipstick delivers up to 16 hours of flawless wear. 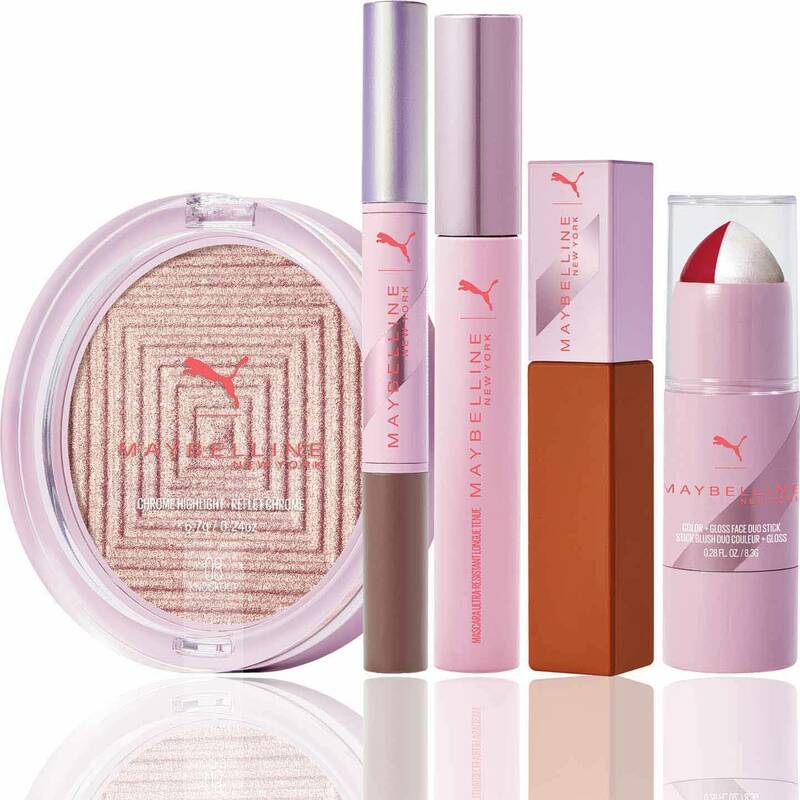 Introducing Puma x Maybelline, an exclusive collection that powers your makeup look from morning sweat sessions to nights out on the town. Drench your lips, get intensely saturated and waterproof liquid matte colour that lasts from morning-to-night. Featuring a unique arrow applicator for a more precise application, get up to 16 hours of highly pigmented liquid matte colour. TIP – For easy removal, use with Maybelline’s SuperStay Eraser Lip Color remover. G949376 INGREDIENTS: DIMETHICONE, TRIMETHYLSILOXYSILICATE, ISODODECANE, NYLON-611/DIMETHICONE COPOLYMER, DIMETHICONE CROSSPOLYMER, C30-45 ALKYLDIMETHYLSILYL POLYPROPYLSILSESQUIOXANE, LAUROYL LYSINE, ALUMINA, SILICA SILYLATE, PHENOXYETHANOL, DISODIUM STEAROYL GLUTAMATE, ALUMINUM HYDROXIDE, LIMONENE, SILICA, SYNTHETIC FLUORPHLOGOPITE, PARAFFIN, CALCIUM ALUMINUM BOROSILICATE, POLYBUTYLENE TEREPHTHALATE, BENZYL BENZOATE, CAPRYLYL GLYCOL, CALCIUM SODIUM BOROSILICATE, ACRYLATES COPOLYMER, ETHYLENE/VA COPOLYMER, BENZYL ALCOHOL, MAGNESIUM SILICATE, CITRONELLOL, POLYETHYLENE TEREPHTHALATE, TIN OXIDE, PARFUM / FRAGRANCE. [+/- MAY CONTAIN: CI 77891 / TITANIUM DIOXIDE, CI 77491, CI 77492, CI 77499 / IRON OXIDES, CI 45410 / RED 28 LAKE, CI 15850 / RED 7, CI 45380 / RED 22 LAKE, MICA, CI 19140 / YELLOW 5 LAKE, CI 15985 / YELLOW 6 LAKE, CI 42090 / BLUE 1 LAKE, CI 75470 / CARMINE, CI 15850 / RED 6, CI 17200 / RED 33 LAKE]. F.I.L. D197346/6. Intensely saturated and waterproof colour that lasts day-to-night. Swipe on fearless limited-edition colours for the ultimate power pout. The saturated matte formula will stay on and true for up to 16-hour wear. High-performance formulas. Street style shades. Experience the collection. Dual-ended, crease-proof eye colour that lasts up to 24 hours. Matte. Metallic. Major. An unapologetic bronze glow with metallic chrome finish. Clean volume. Powerful length. Up to 24-hour wear. Ready, set, swipe! A fearless flush of colour and the perfect glossy finish…in a simple swipe.